Wolves are hostile canines found in several areas. They can be found alone or in small packs of two or three, and will attack anyone who comes near. Occasionally they can be heard howling within a close range. Some wolves may appear to be alone, but when threatened, they will howl and summon two or three more wolves to their aid. They come in several colors, which may vary depending on their environment. 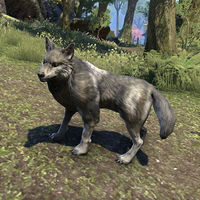 Rare species of wolves in the Cyrodilic Highlands have been domesticated into capable mounts, this was possible by breeding them into larger sizes unseen from wild variety. Some wolves have the ability to summon wolves to fight at their side. The wolf will howl, and two additional wolves will appear, though they are much weaker than usual. It is usually the black colored wolves which have this ability. Stonetooth Bash: Celebrate the New Life Festival with the Orcs of Betnikh. This page was last modified on 21 September 2018, at 08:05.